The exams will still require you to have passed the VCP5 as a pre-requisite so if you haven’t got this yet then maybe a have a look at my VCP5 page for all the resources I personally used and recommend. If you have your VCAP4-DCA then for three months after the release of the final exam you can pass the VCAP5-DCA and gain both the VCAP5-DCA and the VCP5. The beta for the VCAP5-DCA has been announced and I was given approval to blog about it as well as the blueprint in my VCAP5-DCA Beta blog posting. While preparing for the now closed beta of the VCAP5-DCA I went through all the objectives(a few to still publish) for the VCAP5-DCA and added the parts that have changed or been updated since the VCAP4-DCA and listed all of them here. One of the best resources in my studying for my VCP4 was Scott Lowes Mastering VMware vSphere 4 book. Scott’s Mastering VMware vSphere 5 book is now available in both the US and the rest of the world via Amazon in both paperback and kindle versions. I was fortunate enough to win a signed copy at VMworld Europe and have already started browsing through it and yet again it look amazing. Also for those people out there who will be doing the VCP5 I would highly recommend this book. Next is the vSphere 5 Clustering Tech Deepdive book by Frank Denneman and Duncan Epping. The book is available for purchase right now and is geekily available for the kindle also. For those of us that have already read Frank and Duncan’s vSphere 4.1 HA and DRS Technical Deepdive book,this book is a much-anticipated addition to our study materials as the 4.1 book was and still is proving very helpful in my gaining a solid understanding of HA and DRS. With all the new features around HA and DRS in vSphere 5 the new book is a must to gain a good understanding of it all from the masters themselves. For the VCAP4-DCA Sean Cookston’s,Ed Grigson’s and Kendrick Coleman’s Blueprint Breakdowns were highly beneficial and all three are planning on upgrading theirs with the new blueprint once it is released. Due to around 75% of the VCAP5 being the same as the VCAP4 the resources listed will give you a great start point until the guys have updated them to version 5. I will update these and separate them into separate points once the guys update them. David Davis and Elias Khnaser have now released their VMware vSphere 5 Training. Personally I love these training videos as it’s like being on the courses for it but you can watch whenever you want and via your iPad and laptop with the online training option. Even though it is more aimed at the VCP5 level it gives you a great understanding of all the new technologies and features in vSphere5 and how they all work. David also completed all four of the VCAP4-DCA recommended courses videos and you can get all four of them included the recently released PowerCLI and Security courses in his VMware vSphere 4 VCAP Training Package. I used them for my VCAP4-DCA studying and plan to use them as reference and a refresher for my VCAP5-DCA. Jason Nash has worked with Trainsignal and has released the VMware vSphere Optimize and Scale (VCAP5-DCA) series of videos. An extremely helpful resource in my preparations for the VCAP4-DCA was the US vBrownbags hosted by either Cody Bunch or Damian Karlson. The guys have started going through the VCAP5-DCA objectives now and they really are brilliant. Also you can watch all the VCAP4-DCA videos as the differences between the blueprints are massive and the VCAP4 ones were really good. Samir Roshan has broken down each of the objectives for the VCAP5-DCA on his blog here and has linked to all the articles out there covering each section and even the pages it details the information on. Nice work Samir! Read – The objective has been researched and related material has been read over. Lab – The goal of the objective has been reproduced in a lab environment. CLI – Used to denote when an objective has been completed or researched for the CLI command, when applicable. GUI – Used to denote when an objective has been completed or researched for the GUI, when applicable. I have created a mock design scenario and am hoping to go through each section of a vSphere design whilst trying to meet the requirements and mitigate risks. I’m hoping people will comment on the postings and people can learn how to think whilst doing vSphere designs in prep for the DCD, the VCDX or just your day job. Seb Hakiel an Xtravirt colleague of mine has taken on the task of breaking down the VCAP5-DCD blueprint objectives and has almost all of them on his blog here.Brilliant work and certainly wish I had this before my VCAP5-DCD. A number of the beta test takers have blogged about their experiences. Obviously they are under NDA but they are still really helpful in getting an idea of how different the exam is to the VCAP4-DCD. 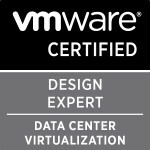 Tom Fojta has posted his experiences here: http://fojta.wordpress.com/2012/02/21/vcap-dcd-5-exam/ and Dave Convery has posted his here: http://www.tech-tap.com/2012/02/21/my-vmware-vcap5-dcd-beta-exam-experience/. As mentioned in my All Things Virtual 25 ,Scott Vessey (@vmtraining) has blogged about the upgrade path for people who are VCAP4 to VCP5 and VCAP5-DCA. As confirmed now by VMware (about 5 months too late in my opinion) it also means that it saves people already VCAP certified having to do the VCP5. Scott has been busy as he also did a VMware vSphere Design book with Forbes Guthrie and Kendrick Coleman. The book is everything you need to fully understand a good design and all the questions and things you need to think about and mention in your designs. I’m currently using this book to strengthen a design I’m doing for a customer and it has been unbelievably beneficial. I’ve also heard from a vExpert and big name in the VMware community that the book is much more helpful than the version 5 of the design course. Alex Galbraith has done two amazing postings on the study resources he used for his VCAP4-DCD and what he did the week before his DCD exam and his thoughts on the exam. It is based on VCAP4-DCD but due to a very large portion of the VCAP5-DCD being the same as version 4 he lists some resources I never knew about or thought about which will be highly beneficial for VCAP5. One of the resources Alex mentions is the DRBC Design – Disaster Recovery and Business Continuity Fundamentals course which is highly beneficial but costs $240 and you only get access to it for 60 days! I know not helpful for everyone but for people who work for VMware partners, the course is available on demand for a year for free via Partner university “Business Continuity and Disaster Recovery Design [v5.X]” 🙂 . I’ve already registered myself on it and am planning to watch it very soon for a customer engagement which will hopefully prepare me nicely for the DCD preparations for DRP and BCP in relation to vSphere 5. Also the course has been updated for vSphere 5 so make sure you do the new one. *UPDATE* As commented on this blog below, it looks like VMware are now offering it for FREE for EVERYONE so go get registered. http://mylearn.vmware.com/portals/www/mL.cfm?menu=topfreecourses . The guys from the APAC Brownbags have been doing webcasts on the VCAP5-DCD for a few months now and have now covered all the sections of the Blueprint. You can register for these and the US vBrownbags which have started to cover the VCAP5-DCA here. There are also a number of the APAC VCAP5-DCD vBrownbags that have already been done that are on the same page as above which I plan to go through when I start preparing for the VCAP5-DCD. Scott Lowe has now released his Designing VMware Infrastructure Trainsignal set of videos. The videos look amazing and I’m hoping I can get my hands on it very soon as I’m certain it is going to be HIGHLY beneficial for my VCAP-DCD preparations. Karim Elatov has done an amazing page breaking down some top links and all of the objectives. Will Huber (VCDX #81) has done a very helpful VCAP-DCD notes download that you can use of his notes for his VCAP4-DCD. 95% of the concepts are the same as the VCAP5-DCD so I’m planning to read through these. If you know of any other resources out there please do leave a comment or drop me a tweet on twitter on @greggrobertson5 as this is really all about helping everyone find the best resources for the exams. I feel very happy to earn my VCP5-DV Certification, any one of you please guide me to appear in VCP5-DCA exam, is there any prerequisest training (as I get authorized VCP5 (ICM) training for VCP5 exam) or I can directely appear in this exam? Congratulations on the VCP5-DV exam pass. There is no prerequisite but there are recommended courses. For the VCAP5-DCA there is the VMware vSphere: Optimize and Scale [V5.0] course http://mylearn.vmware.com/mgrreg/courses.cfm?ui=www_edu&a=det&id_course=135770 . I have some resources for VCAP5 DCA on my website. Cheers for the List Gregg, It came in very useful for the VCAP5-DCD. Thanks for the great post i found it really useful. Need your advice on DCA Exam. I took the exam recently. I got problems with PowerCli for Image Building. When I ran add-esxsoftwaredepot and add-esxsoftwarepackage , these cmdlets are not listed. Not sure if I need to enable this package somewhere. Could you please help me out? where were you running these cmdlets? You should see them no problem as long as you are connected to a vcenter server. Congrats on the pass. I’m not saying don’t do it but the blueprint breakdown by Josh and Jason are really really good so why not point people to that rather than redoing it all? Hi Gregg, I’m very impressed for what you have done so far, i’m mentally prepared to begin the journey, so your blog is a very good place to start and recap imformation, I’m going for VCAP5-DCD, So one question comes to my mind, does the study order matter? Did you followed any particular steps? I’m very motivated, meep in mind that I got poor experience making designs, but years over vSphere administrations works, so any tips from you would be so nice! Not really. I think if you do administration work for vSphere daily then start there and then go across to the DCD portions.There are good begineer then advanced Vmware courses via Pluralsight so start the beginner even if you skip portions of it as it is maybe too basic then go advanced and do additional research on things you might need further information on to understand. Good luck in your prep.